Verdon College had a mass today to celebrate Catholic Schools’ Day. Invercargill has had Catholic Education since 1867, when the first school opened in Conon Street. In 1882 Dominican Sisters arrived to support the work, and in 1897 Marist Brothers joined them. Verdon College opened its doors in 1982. 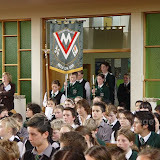 Photos of the mass can be found by clicking on the photo above.